Microsoft quietly launched a new Android app that lets you control Powerpoint presentations on your PC over Bluetooth. With the free powerpoint remote app, dubbed Office Remote, you can control Powerpoint to advance through slides, play and pause embedded audio and video clips, switch to slide thumbnail view, check out speaker notes discreetly on your device and keep any eye on the presentation timer. Office Remote also works with Excel and Word, making it a neat tool to have if you frequently present spreadsheets and documents in front of an audience. With Excel, you can scroll, zoom and switch between worksheets, use filters and slicers, and hop to any named objects in your file. The app offers similar functionality on Word, and additionally lets you jump to headings and comments quickly. 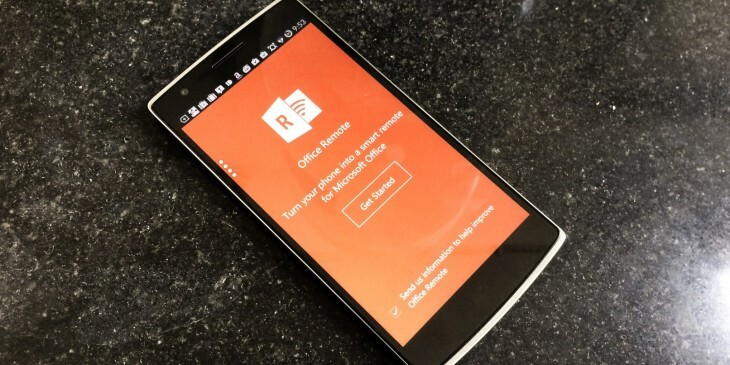 Office Remote was previously available only on Windows Phone 8. You’ll need Microsoft Office 2013 along with the desktop add-in installed on your Bluetooth-enabled PC for this to work.